Last semester, Macalester classes met—as usual—in spots like Old Main and Olin-Rice. They also met all over the Twin Cities, in places ranging from a concert hall to City Hall. More than 60 courses in 17 departments now include assignments that send students around the metro area to explore, research, and collaborate. 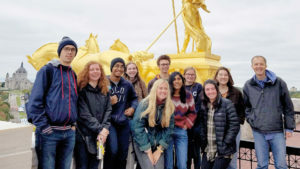 Whether those excursions are one-time guided field trips or semester-long partnerships with local organizations, holding class off campus adds new dimensions to the theory students learn in the classroom. We tagged along with seven Mac classes as they took their education into the Twin Cities. Tiny Footprint Coffee created the world’s first carbon-negative coffee. “This is an example of action,” says biology professor Devavani Chatterjea during a tour with her first-year class. On a Saturday afternoon in October, Ntozake Shange’s for colored girls who have considered suicide / when the rainbow is enuf is playing at the Penumbra Theatre in St. Paul. It’s a small space, and the 14 students in history professor Crystal Moten’s Narrating Black Women’s Resistance course are packed into their seats. The setting itself is one of community: the stage is close to the seating, actors move among and engage with the audience, and there’s not much wiggle room between chairs. 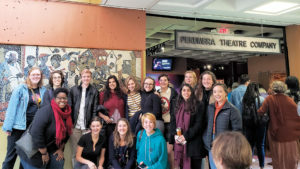 “Every line hit me,” says Maddie Schumacher ’19 (front row, far right) of the Penumbra Theatre production their class attended. One of the longest-running community-based courses at Mac is the anthropology department’s Ethnographic Interviewing class, launched nearly 50 years ago using an approach pioneered by professors James Spradley and David McCurdy. Thousands of students have completed the course, which requires them to choose a microculture—and an informant in that microculture—and conduct seven hourlong interviews, then use that information to write a 30-page research paper. Although students aren’t required to go off campus for their project, about half of them do—and Mac’s urban location creates an especially rich variety of options, says professor Arjun Guneratne, who has been teaching the class for 15 years. Over the years, his students have explored microcultures that range from firefighters to funeral home directors. To complete the assignment successfully, students must build good rapport with their informants. 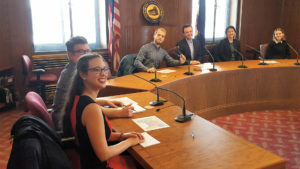 Elizabeth Abramson ’19 (second from right) and her classmates used GIS technology to analyze access to early-childhood programs in St. Paul—and presented their findings at City Hall. Elizabeth Abramson ’19 (West Newton, Mass.) and her classmates in geography professor Laura Smith’s Urban GIS [geographic information systems] class spent the semester analyzing access to early-childhood education in St. Paul. Using GIS technology, the students examined three angles: the demographics and areas of highest need, current distributions of childcare programs, and the barriers families face in accessing programs. The project was a collaboration with St. Paul City Council member Rebecca Noecker, who is driving an initiative to implement universal childcare for all St. Paul three- and four-year-olds. The class visited City Hall twice to discuss the project and present their findings to an audience that included Noecker and her team, other council members, education consultants, and the St. Paul Public Schools superintendent. In late October, 12 Introduction to Social Entrepreneurship students are presenting midterm projects in downtown St. Paul’s Osborn370, a new Twin Cities entrepreneurship hub. In a large open space with start-up employees working nearby, the students are in front of three judges with expertise in marketing, sales, and human resources. The judges’ incisive questions keep teams on their toes. In groups of three, the students identify a social problem and pitch their solution—beginning to navigate the challenge, as professor Kate Ryan Reiling ’00 writes in her syllabus for the sociology and international studies course, of taking an idea and turning it into reality. Tori Gapuz ’21 (Plainfield, Ill.), Juan Diaz ’22 (Little Rock, Ark. ), and Swopnil Shrestha ’21 (Minneapolis) outline the problem they’ve identified: despite many student organizations and identity collectives on campus, there aren’t individual outlets for students to showcase their hometowns and cultures to share with their Mac community what life looks like back home (and vice versa). They want to devise a visual platform: a social media campaign, perhaps, or a YouTube channel for vlogging. In his first semester at Macalester (and in the United States), Alexander Thomas ’22 (Kerala, India) explored the Twin Cities through political science professor Patrick Schmidt’s Politics of Architecture first-year course. On a Saturday in September, the class used the Green Line light rail to visit three St. Paul sites—the new MLS soccer stadium, the Neighborhood Development Center, and the State Capitol—with a break for lunch on University Avenue. The coffee creates a cozy atmosphere at the Brooklyn Center, Minn., roasting facility, and right away, the conversation digs deep. Krohnke and his team field questions about coffee farming, fair trade logistics, farmer compensation, climate change, and sustainability. In the past 10 years, the company has dedicated itself to creating the world’s first carbon-negative coffee by supporting reforestation efforts in Ecuador, where Tiny Footprint will fund the planting of its 100,000th tree this winter. 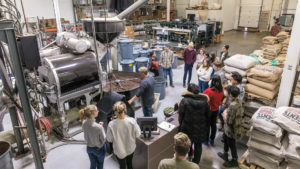 Later in the visit, the group tours the warehouse, where giant burlap coffee bags are stacked on pallets and batches of beans churn through a rumbling roaster. The Tiny Footprint visit is part of the syllabus for biology professor Devavani Chatterjea’s first-year course Health in the Anthropocene, which examines the forces that shape the interconnected health of humans and our planet. The conversation with Krohnke touches on many of these issues, such as extreme weather, equity in the supply chain, and business challenges including how to distribute the coffee more broadly without increasing the carbon footprint. “We’ve grappled with this question of scale all semester: the efficiency of scaling anything up to support more humans and human activities also scales up the footprint in lockstep,” Chatterjea says.